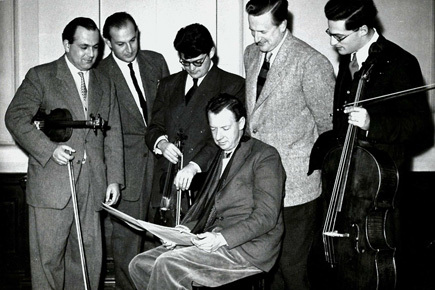 For a composer known primarily for opera, Benjamin Britten had a remarkably facility for other genres. A case in point is his string quartets which span his entire career from the 1940s to the end of his life, creating a remarkable monument in 20th century chamber music. For Snape Maltings' annual Britten Weekend this year, 19 to 21 October 2018 the focus is going to be on Britten's string quartets and his other chamber music. Britten's String quartet No. 2 took Purcell as its inspiration, and at Snape it will be performed alongside a transcription for string quartet of Purcell's Fantasias. Britten's String Quartet No. 3, was written in the last year of his life, and premiered by the Amadeus Quartet two weeks after the composere's death. It will be performed alongside a short story by Henry James. In fact, the quartet will receive two performances, the first with the audience will be surrounding the players on the darkened Snape Maltings stage! Further information from the Snape Maltings website.